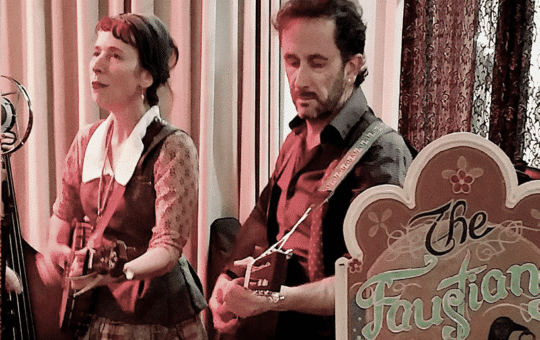 Helena carried a wealth of tradition with her when she moved back to NZ after spending 15 years in West Virginia learning old-time banjo and ballad singing. When she came back to NZ she began writing her own songs and became the foundation of The Faustians. With Scott Pilgrim on driving guitar and tight harmonies and Helena on banjo and fiddle, the songs are brought to life. Vingettes of a lonely man whose only friend was a chicken, a death ridden dust bowl lament, a tribute to Amy Winehouse, Mother Mary with a sword and shield, and of course, ‘Zombie Apocalypse.” The songs paint an eerie landscape, dark but spiked with Helena’s wry humour. The Faustians will immerse you in a unique, rich and mesmerising Old-time world.